We try to keep what makes our area special, the little things as well as the big ones. Here are two examples where we have identified special local features and made sure that they are valued and well looked after. ​There are several back alleys between streets in our part of town, which give rear access to houses. Some of them are illuminated by the lamp posts we have saved and restored (see story below). Two of them - the one off Shurdington Road between Gratton Road and Edward Street, and the one connecting St Philip Street and Suffolk Street - contain quaint instructions from a bygone age. 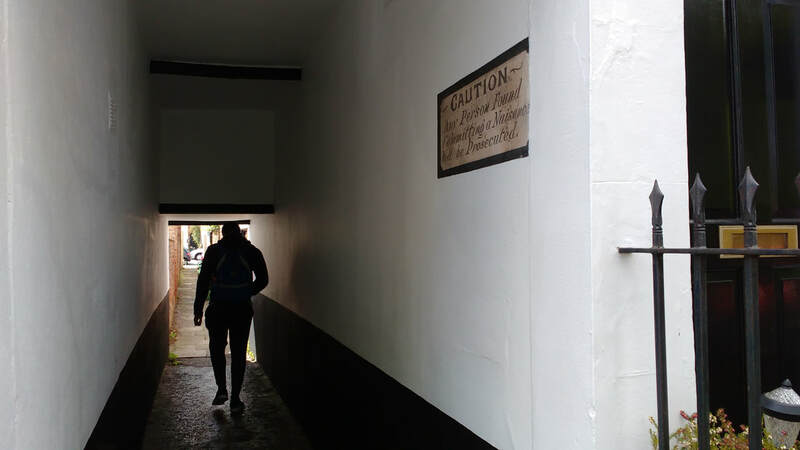 The sign near St Philp Street was carefully protected when the owner repainted the surrounding walls. But the sign off Shurdington Road was in a very poor state and barely legible. We took it down and with the help of a local picture restorer, Pippa Jeffries, restored it. ​So now try and find these charming signs - but whatever you do, don't commit a nuisance! In 2014, all our lamp posts were converted to LED lighting. Our area looks the better for it: less light pollution and no more sickly sodium glare. They look very smart and really help to spruce up our neighbourhood. One more lamp post on the corner of Tudor Lodge Drive and Tudor Lodge Road remains to be done. Hugh Arthur (hughrarthur@googlemail.com) is co-ordinating the project. Let him know if you are interested in being involved.